Bare land with river flats. Adjoining the village of Ailsa Craig and potential for incredible building site with gas and water at road. 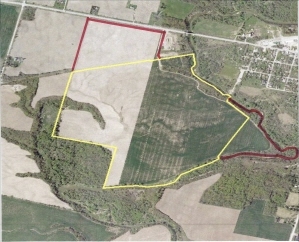 Approximately 250 workable acres. Systematic tiling 25’ to 40’ (maps available). 180 bushels corn yields average. Huron Clay Loam and Loam soils.